Kelsey is my Drama Queen. She doesn't like to eat anything but pizza, macaroni, and chocolate. Of course we have her eat other things and even if she's never tried something she'll swear up and down she doesn't like it. She even has her "gag" technique perfected. Brushing her teeth is no different. She doesn't like toothpaste. When we got the Tasty Paste in she told me right away she did not like it. This Giveaway has ended. Follow us for more great giveaways. Read on for more information on this product. She even threw a pretty dramatic fit refusing to try it. Well, she did try and even though she didn't "rave" about it she actually brushes her teeth. She doesn't complain or gag and this is huge! The other munchkins really like the flavor too. The awesome folks at Tanner's Tasty Paste are giving away a tube of Banilla Bling and Baby Bling to one lucky reader! By working with children everyday, Dr. Holden (inventor of Tasty Paste) learned which flavors children respond to best when using toothpastes and prophy pastes. This understanding of children's favorite flavors has lead to the development of the Tanner's Tasty Paste line of toothpastes for children. If children enjoy the flavors of their toothpastes, it is likely they'll brush better and more often. And, if they brush better and more often, they'll have fewer cavities! Well, we all know that getting kids to brush their teeth two times a day can be anything but a day at the beach. The strong taste of ordinary toothpaste can have even the best of us running to hide under our covers! With Dr. Janelle Holden's new Banilla Bling, brushing your teeth is as fun as eating a vanilla ice cream cone! 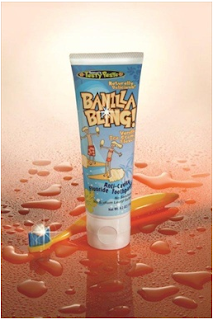 Banilla Bling packs the sweet flavor of vanilla ice cream into a healthy fluoride toothpaste which contains no Saccharin or Sodium Lauryl Sulfate. Kids absolutely love the taste and parents love dentist approved cavity fighting. ALL TANNER'S TASTY PASTE TOOTHPASTES CONTAIN A 15% XYLITOL SOLUTION! Disclosure: From time to time I have the opportunity to share a giveaway with my readers from another Great blogger. This is a Review hosted by Donna's Deals and More!